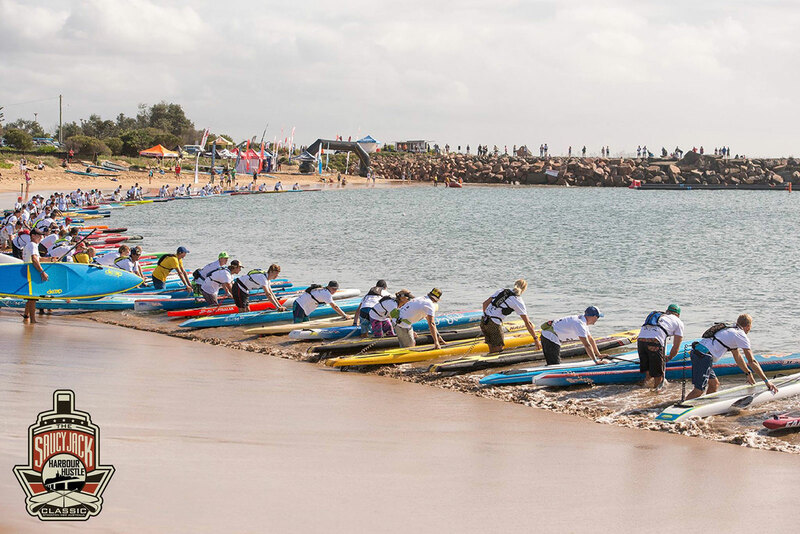 JP Australia’s James Casey and ONE SUP’s Angie Jackson took out the 2016 Saucy Jack Classic in New South Wales, Australia last weekend, defeating an elite field to show they’ll be genuine contenders on the international circuit this season. The Saucy Jack Classic (formerly “Harry’s Paddle”) was split into three separate races this year: The BOP race, the knockout sprints, and the 10k “Harbour Hustle” distance race. Points were combined from each to produce the overall event standings, and with seven of the world’s top 35 ranked men on the start line, including four of the top 15, it was always going to be a tough one. On Saturday morning we were greeted with beautiful sunny conditions but absolutely no waves, which made the Battle of the Paddle-style surf race a long, flag, grueling affair. With a rather sudden shout of “Go!” from the starter catching a few competitors off guard, the opening few hundred metres were frantic as the contenders jockeyed for position. By the end of the first lap, the top nine guys had broken away and would stay relatively tight until the end of the third and final loop. Controlling the pace for much of the race was Kelly Margetts, hero of the 2015 Gorge Paddle Challenge, along with former world number four Jake Jensen. The pair held the front spot all the way to the beach, where Kelly beat Jake in a sprint up the line despite giving away more than two decades in age to his fellow Gold Coaster (Jake turned 21 a few months ago, while Kelly is known as the “World’s Fittest 43-year-old”). After the BOP race, the top 10 guys moved through to the knockout sprint challenge, which is an interesting new feature of the event. In a head-to-head bracket, Australia’s finest were whittled down one by one as they sprinted around the 200m course in pairs. Finally it came down to Kelly and James, with the latter sprinting clear to take the win and keep his hopes of the overall event title alive going into Sunday’s distance decider. After the calm waters of Saturday, paddlers were greeted with a howling southerly wind on Sunday morning, which had whipped up wild seas that were creeping into the supposedly protected waters of Newcastle Harbour, the host venue for the Saucy Jack’s 10k race. This produced the ironic situation of the long distance flat water race being far bumpier than the surf race, which in turn made the usual flat water draft trains something of a luxury. With the impressive sight of 100 paddlers lined up shoulder-to-shoulder on the line (pictured above), the start was once again a frantic affair as several of the country’s finest jockeyed in the lead pack. But it didn’t take long for the bumps to have an impact on the virtual standings, with James Casey putting the hammer down at the second buoy turn (the “buoys” in the distance race were in fact giant harbour markers — Newcastle is home to one of Australia’s busiest ports). James, or “Jimmy” as he’s affectionately known, put a 10 board length gap into the field within the space of a couple of minutes, and then proceeded to extend his lead over the next hour. It was a truly remarkable display from one of the most under-rated paddlers not only in Australia but in the paddling world in general. From my vantage point at the rear of the field, I could see Jimmy paddling out front on his own the entire time, with the chase group of eight world class paddlers unable to close the gap. It was reminiscent of Danny Ching’s effort during the Gorge Paddle Callenge course race last year. As the race clock ticked over the one hour, Jimmy held his nerve to triumphantly cross the line and prove he’s going to be a force to be reckoned with at some of the big international clashes this year. But despite winning two out of the three races, Jimmy’s overall event title wasn’t secured until Kelly Margetts crossed the line a minute later in a close sprint for positions 2nd through 9th. Kelly needed to finish 2nd or 3rd to secure the Saucy Jack champion’s trophy, however the elder statesman of the international paddling world couldn’t get past Jake Jensen, who took his second runner-up finish for the weekend, and defending champ Trevor Tunnington, who claimed third. In the end, Jimmy won the weekend by the narrowest of margins, a result so tight that the overall champ wasn’t known until the presentation a couple of hours later. But Jimmy was nothing of not a deserving winner, showing his strength in a variety of conditions and distances, taking out both the 200m and 10,000m events. Jimmy’s win this past weekend is no fluke, and comes on the back of some excellent recent form. The under-rated Aussie was sixth over the line at the big Molokai 2 Oahu channel crossing last year, before finishing runner-up in the 2015 Australian Titles distance race. Just a few weeks ago, Jimmy went toe-to-toe with Aussie Champ Michael Booth up at Noosa, while his win here in Newcastle will give him plenty of confidence heading into the international season. The New South Welshman will be making appearances at OluKai next month, before heading back to Maui for Downwind Month in July and then to Hood River for the big Gorge Paddle Challenge in August. Based on his performance this past weekend, I daresay Jimmy is going to take quite a few big scalps this year. While the men’s event was decided by a hair, Angie Jackson left no doubt in the women’s race, sweeping the weekend ahead of her fellow world-beaters Terrene Black (runner-up in each race) and Karla Gilbert. Angie, the current world number five, is looking strong early in the season, with her sights clearly set on some of the “majors” over in the States, in particular the Gorge Paddle Challenge later in the year. Karla looked strong in the BOP and led early, however a couple of late mistakes around the final buoys sent her back to third. It was even worse in the distance race, with the former Queen of Australia’s lifeguard racing scene forced into a “DNF” after a rogue wave inside the harbour landed her on the rocks. Terrene kept pace in the BOP and was only a metre or two behind in the sprints, but Angie flexed her muscles in the distance race to seal a perfect weekend. All in all the Saucy Jack Classic was a great weekend of racing. Hats off to event director Pete Cox and his crew for a fun 48 hours in a beautiful part of the world. Looking forward to next year already.